06/2014 – We’re happy and sad to say our Windy sold early this month. We didn’t get what we wanted for her but at least she has a new home with a nice German man who is excited to hit the road. He’s considering keeping a blog so the story of our Windy can live on during his travels! If you want to know why we are selling our beloved Windy, you can read all about it in our Dear Windy letter. You all know our Windy, she is a 2011 Monaco Vesta 32 foot PBS model (if you don’t know her check out the Windy the RV Page for extra photos and videos). She’s 32,000 miles young and just hitting her stride. She has been a fantastic coach and most definitely unlike any other coach on the road. Our asking price is $114,999 or better offer. MSRP on a new 2011/2012 Monaco Vesta started at $226,500, so it’s a pretty good deal for being only 3 years young. With the upgrades and Off the Cord enhancements our Vesta, it’s one hellva deal! Please leave a comment if you’re interested in purchasing Windy, she needs a loving family to take care of her…who knows maybe even another blogger?!? **Our Windy just had a professional wash and wax (11/10/2013) and she is scheduled for a Monaco factory inspection, oil change and repairs at the beginning of December 2013, so she’ll be in “Like New” condition from the factory when she sells. 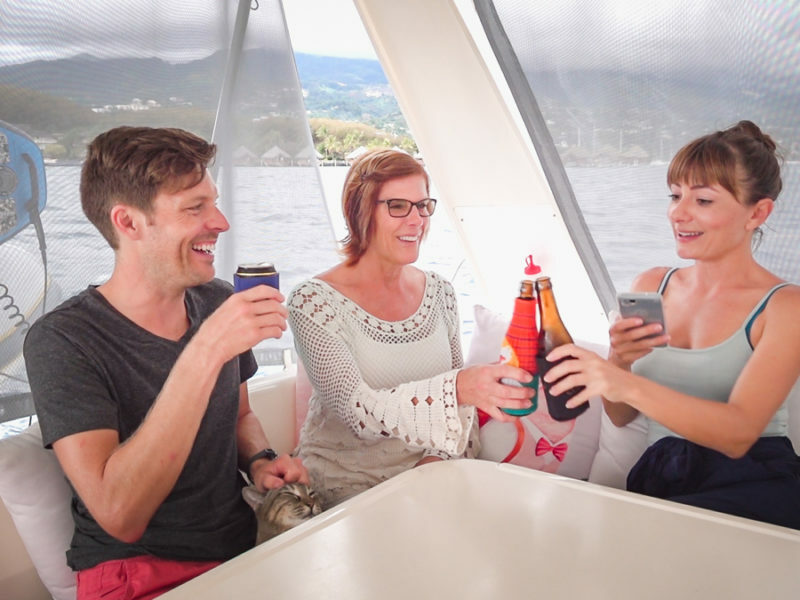 Love your video blogs both when you traveled on 4 wheels and now that your on the high seas. 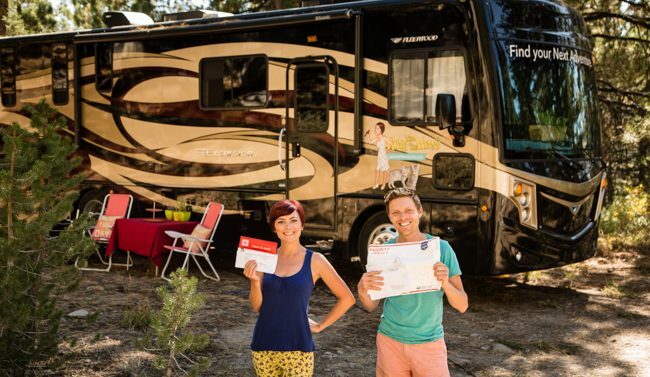 You sold the 2011 Monaco Vista Windy RV in June, 2014. Which RV had the diesel engine in the front and how did it compare with the engine noise in the Fleetwood Bounder? How did you get into testing the Fleetwood RV’s? The Vesta is a FRED. It was better insulated than the Bounder but still its loud when climbing mountains. I’m on the hunt for a 30ish foot RV and am drawn to the Vesta.  Your info and videos have been key to my initial leg work. This is a person question…why did you let your Vesta go for so cheap? Mileage was good, it was clean, and the upgrades were amazing. I plan to upgrade whatever I get following your Vesta upgrades. Seems you could have gotten premium pricing. Sorry if I’m rubbing salt in a sour spot!! I’m finding them for a bit more than you sold for. I’m just curious if maybe there is more room to negotiate than it seems. There’s a 2013 for sale in Ohio asking $129k…no upgrades. Not many used ones out there. Thank you for your blog!!! A friend owns 1 billion dollars. He said if I have RV then he would give me half of it. Please submit keys immediately and send title. Also send tax monies. Then he said he woild give me money and maybe I can pay you then. Thank you. Like your motorhome. We should take and work something out? I have a motorhome that I am remodeling. Send me an email. Have you considered a travel trailer. I have owned two during the last thirty years. I have never had problem with my trailers. My current trailer is a 17 year old Sunnybrook that has only required tires and a recent rubber roof replacement. This trailer has been towed across many miles of rough desert roads during my off road adventures without failure. I would never take a motorhome that far into the back country. The fear of a flat tire, break down, or just getting stuck is too much to worry about. My truck is a 98′ Chevy 4X4 that has never let me down. If it did, there is always a local repair facility nearby . 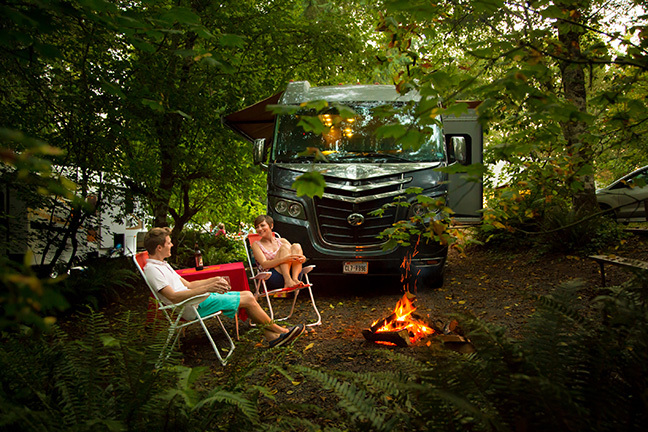 My cost of ownership and hassle have been very little compared to owning a motorhome. I would not trust traveling in a motorhome of that age . I have friends with motorhomes that have nightmare storys of break downs and expensive, time consuming repairs. Most of us work hard for our money. If you compare trailers to motorhomes; it is not even close in cost of ownership. Furthermore, the “worry” factor is much less with a trailer. I also feel that a truck and trailer are easier to drive. With today’s equalizer hitches; I barely know that the trailer is behind me. I have driven my friends motorhomes and I feel that they are much more stressful to drive. Good luck with your choice. Hmmm, so Windy is really up for sale, eh? A little sooner than we had hoped, though we are readying our house for sale with plans on getting on the road next year! Perhaps if she hasn’t been scooped up yet, the two of us and our two cats can move in! Sorry to say Kerri that one way or another Windy will have new owners by January 1st! You sure you ladies don’t want to buy early? Hmmm…. tempting…. Where is she going come January 1? we’ve just listed Windy again…lower price and better options than before. We are late to the game, just having seen your HGTV episode. We, too, have a 2011 32 foot Vesta, same color as yours, without the glamorous name 🙂 We searched high a low to find an RV that didn’t look like my great grandmother’s living room and the Vesta was about it. Good luck with the sale, hope you are successful. oops. Just noticed the top post about not selling. Sorry for the previous question. ha ha, no worries don. Glad your finding what you are looking for! Did you sell the Vesta? I missed the news. I’m considering going full time, or at least extended time RVing. I’ve really appreciated your detail cost reviews. Thanks. For my budget planning I want to include a budget for RV depreciation. That way I’d add about $70,000/24 months, or nearly $3,000 per month to your cost of RV living. That sure changes the cost enormously. If you did sell, what did you replace it with? 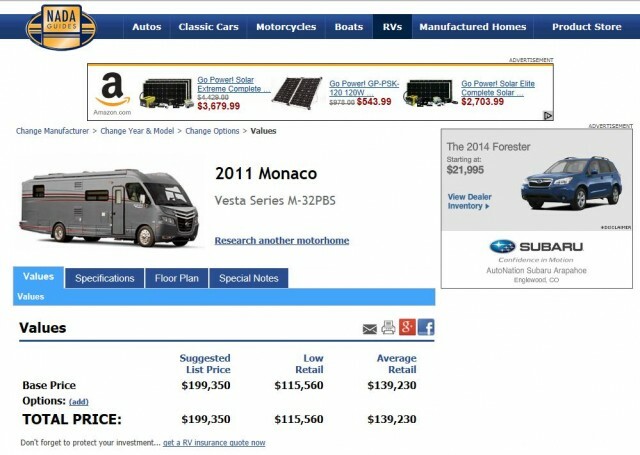 I see you are selling your Monaco Vesta.. do you plan to keep full timing in an Rv? If so what is your next rig? if you could do it all over again what unit would you buy the first time around and why? What made you want to sell the Vesta? What were peoples reaction’s when you first told them you were going to sell your house and get an rv? were they supportive or just like what is wrong with you? Selling: We will continue to RV at least for another year or more. 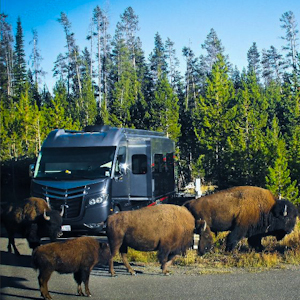 We love life on the road, and there is NO other way to enjoy North America on an extended trip. Why Sell the Vesta? : 1. We want to live off the cord more, the smaller the RV the better locations you can get into. 2. We want to stay at more State Parks and many have a 30′ limit making our Vesta a little too long for those small beach state parks on the west. 3. A challenge to downsize even further, if we can find that perfect small coach it’ll be fun to downsize even further. People’s Reactions: Most people thought we were crazy at first since we had what many would call dream jobs. After a year on the road people began to understand how amazing North America is, and friends and family started supporting us online. Now many who never thought of an RV are hooked on the idea. Pretty cool. Check out our new video on our about page, it goes into a little more detail. Thanks for taking the time to write! Remember if you want it, you can make it happen no matter what the odds are. So get out here and join us! hi, i have recently came upon you website and then also your Facebook. i am looking for an rv. I’ve noticed that you have put your for sale and are purchasing a new one. i was just wondering why? is it because of diesel vs. gas or warranty out? and have you sold your rv yet? We are still searching for the perfect replacement and we have not sold our Windy. Warranty is not a huge issue as we can always purchase an extended warranty. As for diesel vs. gas it’s not a great price difference considering a diesel engine has 2-3 times the lifespan of a gas engine. We aren’t going to sell everything to buy can rv but we are going to live a good percentage of time in it for a few years. I am looking for fuel efficiency but roomy. I don’t think we could go smaller than 32ft. And closet space is important. What do you think about laundry? Is it cost efficient to have the machines in the rv? And is it true would a 35ft use more gas or diesel? Also would like to know what you think about buying new or slightly used since the value drops considerably in the first year. Buy used if you can find what you want used. no reason to buy new if you don’t have to! 32 vs. 35 you wont see much of a difference in fuel..its more about weight. If you can have a washer/dryer combo or a small stackable, it would be nice. we frequent the Laundromat and its not a big deal. Check out the Thor Palazzo / Vesta 35ft / Allegro Breeze. All diesel, all well made and all spacious with great storage. This is all good advice, thank you. I will keep you in mind if I think of anything else. It’s nice to know that there is someone out there with knowledge that is not a salesman. Great price, wow. Good luck with sale. …….very nice, and a great price to…..
if i had a lazy $129k you would have a sale…..
but this wont take long to sell! what does the next home look like? Our 300HP upgrade has sparked quite the controversy, so let me clear it up. This engine upgrade IS installed on our Windy. The upgrade is NOT available for any other Vesta. According to Monaco: if you want 300 horsepower you’ll need to either purchase our Windy, or a new 2013 Vesta. I wish I had better news for all the Vesta owners out there, but this is one thing that helps our Windy stand out from the crowd. We are still telling folks about the fun couple hours we had hanging out with you guys while in NH. We are glad we got a chance to check out the awesome RV now that she is up for sale. Hope to see you next time you are in our area with your new ride. We will be pro’s at dominos by then. We enjoyed our “Mexican Train” game equally as much! Hope to see you guys in the road full time in the near future….you just gotta get that website off the ground and it’s full speed ahead! We have had a Winnebago View since 2006. LOVE IT. We don’t travel as much as you as we still have our day jobs, but its easy to stay in a week at a time. Mo & Mika, you crack me up. A smart car and a small tear drop would be funny! On the RV, you have for sale, does the table convert into another bed? Does the sofa fold down? how many people does the RV sleep? Ron, Windy serves 6 for drinks, 4 for dinner and sleeps 2! The table doesn’t convert into a bed. Sorry. i wish that i could buy windy. my husband and i have been talking about going on the road but we still have to wait another two years before we can go. we also own our house and it wouldn’t be good for us to sell right now, i wish we could though. look forward to seeing who gets to buy windy. also look forward to seeing you buying another r.v and what you come up with. good luck. Jessica, Thanks we are excited to see what unfolds! So sorry to hear you are dismantling Windy, selling her in one-foot sections and becoming coal miners. I have a cousin in Milwaukee who is a bit of an RVer. I will let her know she has a chance to get a look at Windy before you hit the road again. Bruce, I think that one might take the cake! Although, selling Windy in one-foot sections might be a better money maker! If you guys are headed to Texas, a stop in Terlingua is a MUST. If you get a chance to check it out, please pour a beer on my father’s grave in the Ghost Town cemetery. Horsepower Bump: This is available for a select few Vestas. Monaco thought they could enhance our Windy however she’s not able to get the upgrade (it has something to do with the location of the engine & cooling system). We have removed this item from the list. If you’re interested in this option you should ask Monaco or your local International dealer. Engine Brake: If you don’t have the engine brake installed on your Vesta you cannot add it. Factory Repair: The majority of our repairs have been completed at the Oregon Factory, however our most recent repairs have been completed at the new Wakarusa, Indiana factory. 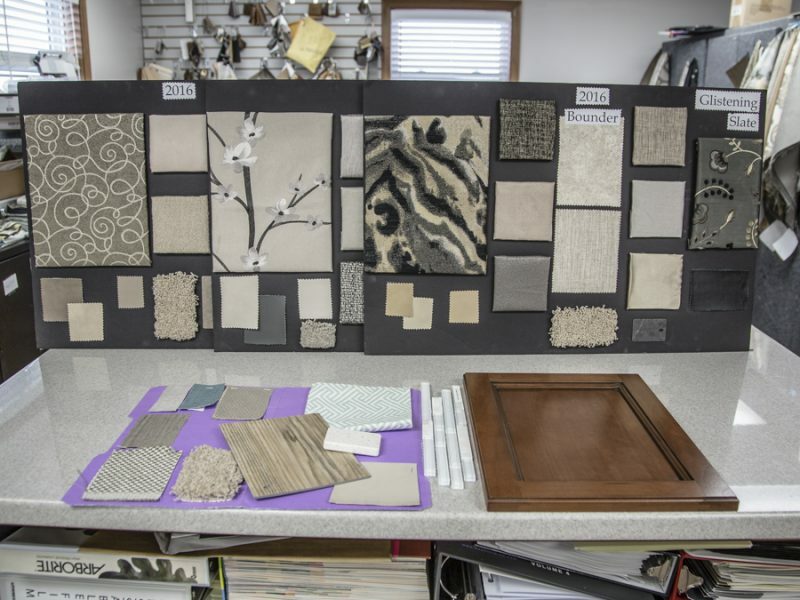 Both factories have been more than helpful and accommodating to our needs. I have a few suggestions for places to visit in Tennessee. The first one is Fall Creek Falls State Park. It is a really pretty park and there are lots of things to do like hiking, hiking, golfing, and fishing. It has a nice campground, too. My family and I camped there when I was younger. Another place is Great Smokey Mountains National Park. The Cades Cove Loop is a pretty drive and you can see wildlife like deer and bears. The hiking and biking is great, also. My city, Chattanooga, has some neat stuff, also. There is Rock City, Ruby Falls, Incline Railway, Chattanooga Choo Choo, and Lookout Mountain. Downtown Chattanooga has some neat restuarants and shops. I hope this helps you both out. Hi.  Have periodically checked in on your blog. Enjoy it! We are in the exact opposite position as you. We have a 25 foot Fleetwood Quest and are thinking about upsizing to a 32 foot vesta. The thing we am worried about giving up is mobility- the thing the thing we want is more space. Classic case of wanting what you don’t have. We may go to Alaska in 2014 so it is a big decision! Tim, yep sounds about right! We know we are in for a challenge! Two questions, first, why are you downsizing to a smaller RV? Second, what part of Texas are you going to be visiting? Enjoying the website, just saw your House Hunters episode yesterday. Thanks. Steve, We have had our RV for almost 2 years now and are downsizing for 2 main reasons. 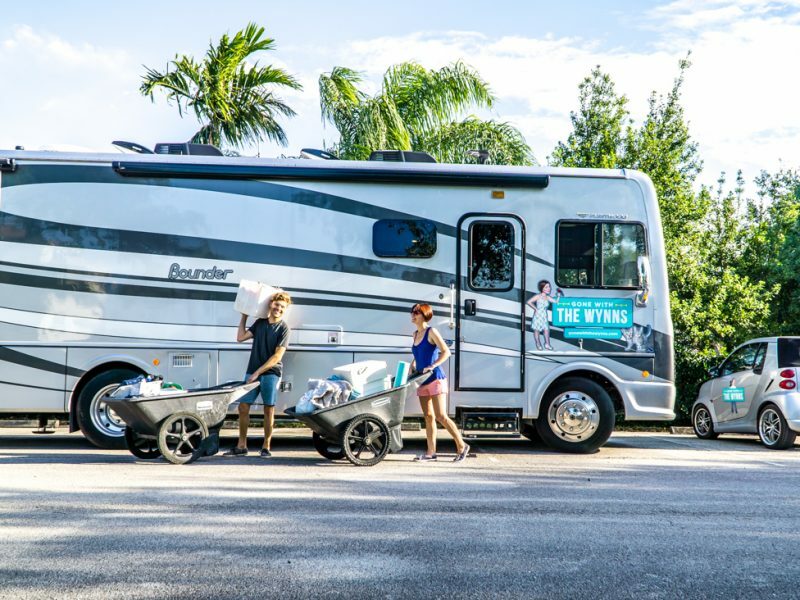 one is we want to take our followers along through the whole process of looking, buying and breaking in an RV (with way more info and more real that what you watched on HGTV). another is we want to challenge oursleves to live even more simpler and smaller than we already do. We are headed to Dallas Texas for a couple of weeks. Thanks for following! My husband and I fell in love with Windy yesterday when we saw your story featured on HGTV. So much so, we spent a good hour or so discussing life on the road in an RV, as opposed to our current situation of traveling via our VW Jetta and places that leave a light on! We spent awhile on the Monaco website last night and just noticed that Windy is up for sale. Hmm… the wheels are turning, and you mentioned you are headed to TX? Might I ask what part? We live in McKinney, TX, an hour south of the OK border. Let us know how long you plan to be around these parts of the woods. Tina, we are headed for Dallas Texas so we will be close! We would be happy to give you a tour! I saw the HGTV episode of you two buying the RV yesterday. I think that the idea to travel around the USA for a couple of years sounds like fun. I live in Chattanooga, TN, and your blot says that you are going to visit Tennessee in October. What places in Tennessee do you plan to visit? Maybe I can give you some ideas for places to visit here in Tennessee. Happy traveling to both of you. Katie, we have had a small change of plans this past week and as of now we are not sure where we will be just yet. Keep an eye on our Where The Wynn’s Blow page as I will update that as we get closer! Thanks for following! I just saw your blog for the first time today…. and was really excited to start following you on the road… then I saw this:( My husband and I LOVE to travel and are both photographers. We just moved to Seattle from Texas and are looking into a new custom made tear-drop camper. It’s much much smaller than yours of course but we are only doing local camping. Where are you right now with Windy? If you are close to Seattle I would love to come look if she’s still for sale. Jamie, We are in Indiana and headed to Texas. She is still for sale! We are looking to go to something around 25-27ft which will be much shorter than windy. So sorry to hear you guys are hanging up your RV Adventure hats. I just saw a rerun of the episode of you guys purchasing your RV. I was looking you up to suggest coming out to Michigan and staying a few nights at Mackinac City (pronounced mack-i-naw) and taking the ferry over to Mackinac Island, which is a historic state park that doesn’t allow vehicles on the island. Nothing but horses and bicycles! They are also huge on recycling and have some of the most amazing views of the straits of Mackinac. That is at the top of the mitten part of Michigan where Lake Michigan and Lake Superior meet and it is gorgeous! It just seems right up your alley! Katie, we are not hangin up our RV hats! We are just downsizing and going for a smaller RV. Stay tuned. Im currently watching your HGTV special, and I think you’re crazy! But in the best way. You’re really living the dream a lot of us have of exploring the country. We recently spent 8 days traveling from Ky to Seattle when we moved and we discovered so much about America we didn’t even know. And better yet we shared it with our children. I look forward to reading all about the past year and half and your adventures in the future. Thanks Andrea! We love it! more photos please. didn’t get a real glimpse of “storage space”, shower, kitchen. seems kinda small for the pricetag $225k. luxurious? yes. but some rvs have a bunk bed option which seems like a great option for travelling with pets. edward, see our Windy the RV page for a video walk through of the whole coach! We are not asking $225? Sorry to see you want to sell Windy. I wanted to do what you are doing but started too late at 65-70 years. However, you look as if you are traveling a great deal of miles if you followed the states as listed. Have you considered staying in one state longer before moving to the next adjacent state? I used to read a website called Workamper News where people stay for weeks or months for free and assist the campsite with free work. If you plan on living on the road anything smaller than Windy might be cramped. Hope this will give you some thoughts.